It’s vital these books be read in order – it’s the story of two friends from their childhood days struggling through elementary school in Naples circa 1944 through old age in 2010 or so as well as the progressive deterioration of an old Naples neighborhood during the same time frame – post WWII through post 9/11. Many contemporary issues are covered as well but the friendship which highlights the first and last books is the central focus. I suppose it’s a “women’s novel” in that it explores the lives of two women over the course of almost 60 years including their struggles for education, for economic security through careers, for love and children and recognition – for self-respect as well as respect in the eyes of their worlds. It covers childhood, adolescence, young adulthood and maturity through grand-parenting. It deals with the urban gangs of the fascists, commercial and political opportunities of the 1950s, struggles and realities of the 1960s and 70s, family entrapments and estrangements, love, loyalty and betrayal through the 1980s, ’90s and ’00s. This is in addition to the ups and downs of a friendship lasting decades. In order the books are 1. My Brilliant Friend, 2. The Story of a New Name, 3. Those Who Stay and Those Who Leave, and 4 The Story of the Lost Child. 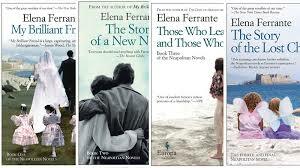 My Brilliant Friend opens with the mature Elena Greco not being able to find her life-long friend Lila Cerullo and setting out to write the story of her life – the rest of the hundreds of pages are that story. I think this may come to be a really important work, one that will likely make its mark in the canon of women’s literature because it tells the tale of what women really went through in that place and those times and even today.